King Phillip scored a thrilling win against Mansfield to seize control of the Hockomock Kelley-Rex Division. Ed. Note- In the interest of full disclosure, we should let you know that our buddy John is a coach at King Phillip. Still, we trust his objectivity, and certainly think he has a reason to be proud of his team's performance last week. 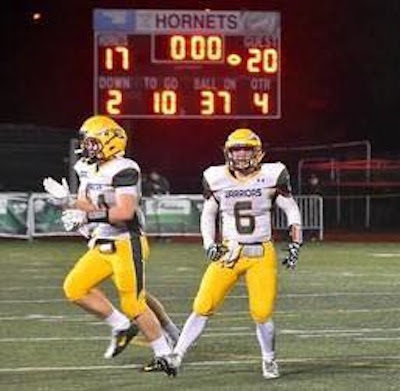 It was another exciting weekend of high school football in Massachusetts. Here are ten thoughts from the weekend that was. 1. Billerica’s 24-21 win over Everett is a program-altering win. The Indians had a big win over Andover two weeks ago, but beating Everett takes your program to another level. The Indians are legit. 2. I guess Bridgewater-Raynham awakened the sleeping giant when they beat Xaverian two weeks ago. The X hasn’t surrendered a point since, and Catholic Memorial only had 23 yards of total offense on Friday night. 3. King Phillip earned a gutsy win over Mansfield on Friday night 20-17, but you get the feeling these two teams are going to meet again in the playoffs. 4. It’s official- Lexington is legit, after whacking Reading 56-27 on Friday night. If you haven’t heard of junior quarterback Sal Frelick, get to know the name. The kid has already committed to Boston College to play baseball. 5. Westwood once again proved to be a thorn on Holliston’s side, beating them 36-34 on Friday. The Panthers are still the favorites in Division 3, but the Wolverines proved that they are beatable. 6. Duxbury is a runaway train at this point. They beat Plymouth North 46-0 on Friday. Outside of the X, can anyone in the state play with the Dragons right now? Probably not. 7. Just when Sharon thought they were turning the corner in the Hockomock League’s Davenport Division, Stoughton reminded them that they have a long way to go, blanking them 37-0. 8. Wachusett had an impressive 27-10 win over Leominister on Friday. The Mountaineers proved that they can play with anyone in Central Mass, because they are physical up front. 9. St. John’s of Shrewsbury outlasted Nashoba 12-0 on Friday night. I thought Wing-T teams had more of an advantage in rain games than spread teams do? I guess not. 10. Don’t sleep on BC High. The Eagles are being over looked right now, but at 3-0, a showdown is looming with the X on October 21st at the Hawk Bowl.